If you want an exemplary all-terrain tire with terrific off-road capability for your vehicle, you will want to check out the Cooper Zeon LTZ tire. The Zeon LTZ has improved steering response to go with very good cornering abilities, something that many tires in this category lack. The aggressive tread makes it possible to traverse the vehicle in water as well because it throws out the mud and propels the vehicle forward. The tires grip small rocks in rocky terrain and do not allow the vehicle to slip. With unique ridged tie bars, the Zeon LTZ creates a siping channel beneath locked lugs for better steering and traction. The tire features a scalloped shoulder design which has a distinct look and serves to improve traction on muddy and sandy surfaces. It also has transverse grooves that assist in gripping wet roads so that hydroplaning does not occur. Circumferential grooves move water from under the tire and prevent hydroplaning. Ride quality with the Zeon LTZ is above average due to the tread compound that Cooper utilizes. Whether it is on the highway or on off-road terrain, the level of comfort may surprise you. Road noise is reduced due to the variable pitch sequence that balances the pitch and reduces noise. It also aids in extending the tread life of the tire, which comes with a nice 50,000 mile warranty. Cooper tires has added a Rim Protector to help in preventing damage to your expensive custom wheels when parking next to curbs. Ventless technology used by Cooper also gives this model an attractive appearance. Overall the Cooper Zeon LTZ tire does a solid job in gripping a wide variety of surfaces, as well as providing a more comfortable ride and a long 50,000 mile tread warranty. It’s easy to see why other tire owners speak so highly about this model. 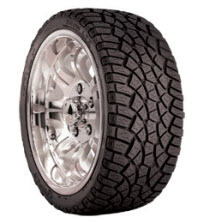 Prices for the Cooper Zeon LTZ Tires range from $220 to around $460 for 20 inch tires. Who Are Cooper Zeon LTZ Tires Designed For? The Cooper Zeon LTZ Tire is for drivers of SUVs, crossovers and light trucks who are seeking a tire which is a good option between a sport truck tire and an all-terrain tire which is good for any type of road surface while providing excellent ride and handling capabilities.